The hippocampus is a key component of the medial temporal lobe memory system that is essential for the formation of new, autobiographical memories. Work in our laboratory attempts to understand the flow of information through the hippocampal formation and the computations performed by the various subfields of the hippocampus and its input structures. To address these issues, we use multi-electrode arrays (tetrodes and silicon probes) to record the extracellular action potentials from scores of well-isolated hippocampal neurons in freely moving rats. These neurons have the fascinating property of being selectively active when the rat occupies restricted locations in its environment. They are termed “place cells,” and it has been suggested that these cells form a cognitive map of the environment (O’Keefe and Nadel, The hippocampus as a cognitive map, 1978). The animal uses this map to navigate efficiently in its environment and to learn and remember important locations. According to O’Keefe and Nadel’s cognitive map theory, it is hypothesized that these cells play a major role in the formation of episodic (autobiographical) memories, perhaps by providing an internal, spatiotemporal framework used to organize and store the different components of a particular experience. 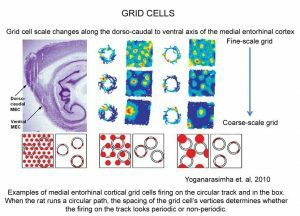 The spatiotemporal framework is hypothesized to come from special neurons called “grid cells” in the medial entorhinal cortex that encode the location of the organism (“self”) using self-motion and landmark cues. This information represents the context of a memory. External sensory information related to specific items in the external world (“other”) is hypothesized to come from high-order sensory neurons in the lateral entorhinal cortex. This information represents the content of a memory. Place cells are hypothesized to combine the context information from the medial entorhinal cortex with the content information from the lateral entorhinal cortex to create context-specific, conjunctive representations of “what happened where” (PDF Document: Knierim et al., 2013) This neural system constitutes a tremendous opportunity to investigate the mechanisms by which the brain transforms sensory input into an internal, cognitive representation of the world “out there” and then uses this representation as the framework that organizes and stores memories of past events. Hippocampal place cells fire selectively when a rat occupies a particular location. Shown below are pictures of a rat foraging for food inside a box and on a circular track. Three examples of place fields recorded in each environment are shown to the right of the pictures. Warmer colors in the place-field firing rate maps indicate levels of higher neuronal activity with red being the highest. Blue indicates no firing. 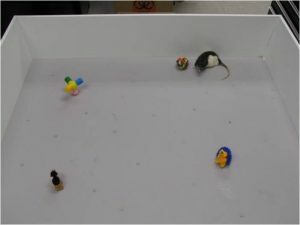 Thus, in the box, the first cell illustrated fires selectively when the rat is near the North wall (by the white cue); the second cell fires selectively when the rat is near the center of the box; and the third cell fires selectively when the rat is at the Southeast corner of the box. The examples at the bottom show cells that fire selectively at different locations on the track. These place fields are controlled by a complex interaction among local cues, global landmarks, and self-motion cues (e.g., vestibular senses). Although place cells have been studied for over 30 years, we are still in the initial stages of exploring and understanding these cells. Although the hippocampus is composed of anatomically heterogeneous subregions, until recently, place field studies have overwhelmingly focused on only a small portion of the hippocampus, the CA1 subfield. Using high-density recording techniques, our lab records simultaneously from multiple subfields of the hippocampal formation, or from portions of the hippocampus in concert with input structures such as the entorhinal cortex. To investigate these questions, we have often used an experimental protocol called the “double rotation,” in which rats are trained to run clockwise for food reward on a circular track composed of quadrants of different textures. In addition to these local cues, there are distal cues at the periphery of the visible environment. On the experimental day, we run the rat in the standard cue configuration, followed by a session in which the local cues are rotated counterclockwise and the distal cues are rotated clockwise an equal amount. This “mismatch” of local and distal cues elicits complex responses from populations of place cells in the hippocampus, as some place cells follow the local cues by rotating counter-clockwise while others follow the distal cues by rotating clockwise. A subset of cells respond ambiguously with no clear relationship to either the local or distal cues and other place cells turn on or shut off. One of our first major findings using the double rotation was a test of classic theories of the autoassociative nature of CA3 neural representations. 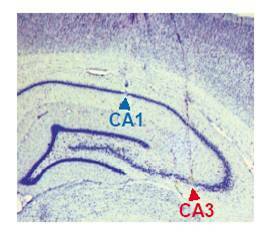 The CA1 and CA3 subfields of the hippocampus differ in their anatomical inputs as well as in their internal circuitry. CA3 pyramidal cells project to CA1, but a significant number of connections are made within CA3 itself. These “recurrent collaterals” are hypothesized to endow CA3 place cells with different properties than those of CA1 place cells. For many years, investigators were unable to find major differences between the properties of CA1 and CA3 place fields. In 2004, our laboratory published the first two papers demonstrating robust, functional differences between CA3 and CA1 place fields (Lee et al., PDF Document: 2004a, PDF Document: 2004b). In accordance with attractor neural network theories, we predicted that the recurrent circuitry in CA3 would generate a coherent response from the population of CA3 place cells when the local-global cue mismatch was detected. In contrast, we predicted a heterogeneous pattern of responses from CA1, which lacks the recurrent circuitry of CA3. The following figure demonstrates that these predictions were verified (Lee et al., PDF Document: 2004b). Each matrix shows the correlation between the firing of a population of CA1 (left) or CA3 (right) cells in a standard (STD) session and in a double-rotation mismatch (MIS) session. 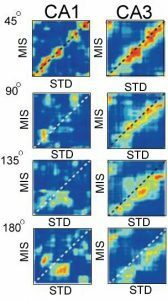 When the mismatch was only 45°, place field maps were similar between the STD and MIS sessions for both CA1 and CA3 populations (indicated by the high band of correlation [red] along the diagonal of the matrix). When the mismatch was 90° or more, the correlation structure broke down in CA1. However, the high band of correlation was maintained in CA3 (although shifted from the diagonal, indicating that the CA3 map was controlled by the local cues on the track). These results indicated that the CA3 population responded more coherently to the manipulation than did the CA1 population, as predicted by computational theories of attractor networks and pattern completion/generalization. We have since followed up these discoveries with further investigations into the nature of the neural coding of the inputs to CA3 from the dentate gyrus (DG), and the medial and lateral entorhinal cortex. The properties of place cells in the dentate gyrus are strikingly different than in other hippocampal areas as the proportion of granule cells with place fields in a given environment is much smaller than in CA1 or CA3. A number of investigators have hypothesized that the function of the dentate gyrus may be to perform pattern separation, the transformation of similar representations into highly dissimilar, nonoverlapping representations. Our recordings from the MEC, LEC, and DG have provided striking evidence in favor of these hypotheses (for review, see PDF Document: Knierim & Neunuebel, 2015). We have provided the first conclusive demonstration of spatial firing properties of mossy cells of the DG, showing that these cells have been misidentified as granule cells in previous literature (GoodSmith et al., 2017). Using a combination of extracellular and juxtacellular techniques, we showed that granule cells were extremely sparse in their firing and highly selective for a small number of spatial environments, whereas mossy cells fired promiscuously in multiple environments, typically displaying multiple place fields in each environment. Delving deeper into the functional organization of the hippocampal circuitry, we have investigated functional hetereogeneity within the subregions of the hippocampus. We have shown that the proximal part of CA3 (the part that is enclosed within the two blades of the DG) performs a pattern separation computation similar to that of the DG, whereas the distal part of CA3 (closer to CA2 and CA1) performs pattern completion/generalization (Lee et al., 2015). This heterogeneity has potentially profound implications. Proximal CA3 projects preferentially to distal CA1, which receives input from LEC; distal CA3 projects preferentially to proximal CA1, which receives input from MEC. Thus, the parallel input-output streams of CA1 (distal CA1-LEC; proximal CA1-MEC) suggest that the CA1-LEC stream requires CA3 output that is biased toward pattern separation, whereas the CA1-MEC stream requires CA3 output that is biased toward pattern completion. The remarkable discovery of grid cells in (MEC) generated enormous attention in the field (Hafting et al., 2005). Grid cells fire in multiple places in the environment, in an exquisitely crystalline, repeated hexagonal pattern. The grid cells of dorsal MEC display a fine-scale grid pattern, with multiple vertices within a recording chamber. In contrast, the grid cells of progressively more ventral MEC display more coarse-scale grids (see figure). Our laboratory published the first report that showed that some MEC cells also responded to the boundaries of an environment (Savelli et al., PDF Document: 2008). This signal may be important for binding the grid cells to the boundaries, thereby stabilizing the MEC internal spatial representation relative to the external world. The other major cortical input to the hippocampus originates in the LEC. 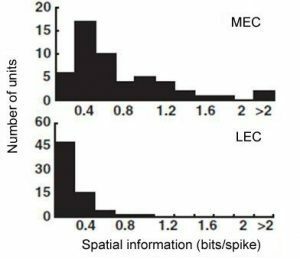 Our lab discovered a major dissociation between LEC and MEC in that lateral entorhinal cortical (LEC) does not show any robust spatial firing properties (neither grid cells or place cells) under standard recording conditions (Hargreaves et al., PDF Document: 2005). The firing rate maps below show strong spatial tuning of MEC cells but very weak spatial firing in LEC. We shown that cells in the superficial layer of lateral entorhinal cortex fire when the rat is investigating objects. Multi-electrode recording in LEC has allowed us to document a number of response types in this region such as firing to familiar objects, memory of object location as indicated by the cell continuing to fire in the location even after the object has been moved, and recognition of a novel object in the environment. Recently, we have shown that the LEC encodes the egocentric bearing of a rat relative to specific items or locations in the environment (Wang et al., 2018). 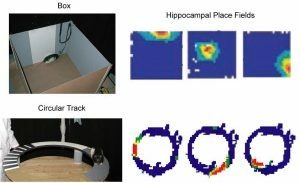 This finding demonstrates not only that the LEC conveys a certain type of spatial input to the hippocampus, but also that the information is represented in an egocentric (“first-person”) reference frame. 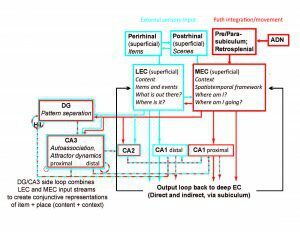 Because episodic memories are also experienced and recalled from the first-person viewpoint of the subject, this finding is consistent with the hypothesis that the LEC provides the hippocampus with representations of the content of a memory. 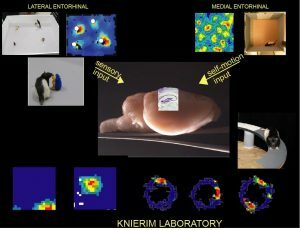 Our lab also engages in computational modeling of various phenomena seen in the neurophysiological data we have collected from the hippocampus and entorhinal cortex. For example, one model describes how the multi-peaked firing of grid cells may be transformed into the single-peaked firing of hippocampal place cells. 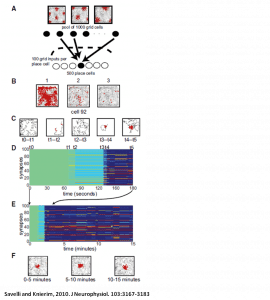 The model theorizes how inputs from grid cells onto place cells may be selected and how place fields may develop in a novel environment as a result of plasticity in the network. (Savelli et al., PDF Document: 2010). Another computational project, in collaboration with Kechen Zhang of the Dept. of Biomedical Engineering, seeks to explain the changes in place field firing or “remapping” seen when the animal is exposed to novel spatial configurations as in the double rotation protocol. Place fields in the hippocampus consist of both a firing-rate component and a temporal component defined by spike-phase precession relative to the local theta rhythm. 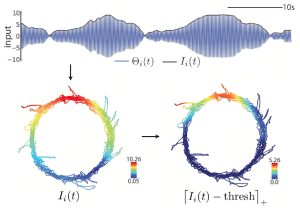 Previous models based on oscillatory phase interference can account for phase precession, but not for the remapping that can occur when an animal is exposed to novel spatial information. A novel room may elicit complete remapping, in which the population spatial code becomes statistically independent, but subtler cue manipulations can induce partial remapping in which some degree of coherence with previous representations is retained. We constructed and are analyzing a model of spatial coding based on spatial envelopes created by interfering oscillators that explains graded remapping as well as all-or-none complete remapping.